Marcus stopped into the Century Cycles store in Peninsula today on his fully-loaded folding touring bike. He left Chicago two weeks ago and is headed to Pittsburgh, possibly further depending on how much time he has left before having to get back to work. 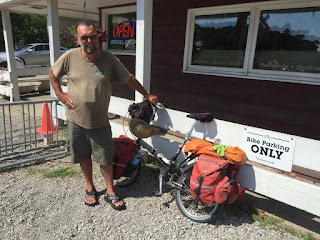 You can see more photos of touring bicyclists who have visited all three of our stores in our Bicycle Touring Photo Gallery.